On October 1, 2010, Doris was driving her Toyota Matrix in Ayer, Massachusetts. She was coming from work and going home, driving west on Littleton Road. She stopped in her lane with her left directional signal on. She was waiting for traffic to pass so she could turn left onto the street where she lived. Suddenly and without warning, a 17-year-old girl driving a black Dodge Ram pickup truck rammed the rear of Doris’ Matrix. The force of the impact was so great it pushed Doris’ vehicle into the eastbound lane. At that moment in the eastbound lane was a Honda Pilot traveling at 40 miles per hour. Doris’ Matrix was launched into the Honda Pilot. With no time to slow, that second impact was severe; it turned the Matrix 180 degrees around. The Honda Pilot was forced off the road, striking a parked truck, which, in turn was pushed into another parked vehicle. In all, five (5) vehicles were damaged in this collision, with Doris’ Matrix and the Honda Pilot being totally destroyed.Our investigation determined that the teenage driver had never driven that pickup truck before, that she was driving with her boyfriend, that her family was under “stress” of a foreclosure and a move, and that she may have hit the gas instead of the brake – accelerating into the Matrix! She was cited by the Ayer Police, but walked away unharmed. With no time to slow, that second impact was severe; it turned the Matrix 180 degrees around. The Honda Pilot was forced off the road, striking a parked truck, which, in turn was pushed into another parked vehicle. 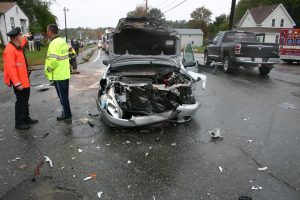 In all, five (5) vehicles were damaged in this collision, with Doris’ Matrix and the Honda Pilot being totally destroyed.Our investigation determined that the teenage driver had never driven that pickup truck before, that she was driving with her boyfriend, that her family was under “stress” of a foreclosure and a move, and that she may have hit the gas instead of the brake – accelerating into the Matrix! She was cited by the Ayer Police, but walked away unharmed. Doris, however, suffered serious numerous orthopedic injuries and serious facial injuries. She was taken to a local hospital and later transported to UMass Medical Center, in Worcester where it was determined that, among other injuries, she had a comminuted fracture of the nasal bones, her nose was displaced on one side, she couldn’t breathe through her nose and she was unable to walk or follow simple commands. She had her nose repaired with sutures and was sent home the next day instructed to follow up with a reconstruction surgeon. Doris sought treatment with a local plastic reconstruction surgeon who determined that it was a “severe nasal fracture…with depression and medial displacement of the right nasal bone and milder lateral displacement of the left. The nasal septum appears fractured and buckled. The vomer is fractured anteriorly.” She underwent surgery which corrected some of the appearance, but did not resolve the breathing problem. That second surgery was undertaken at a Boston hospital. The result was good, but Doris could only breathe out of one side of her nose. While the cosmetic look was better, it was still not the way Doris’ nose was before. The surgeon recommended future surgery and that is being considered. Furthermore, Doris suffered soft tissue injuries to her neck, upper back, and left elbow. Those injuries have not resolved either, notwithstanding physical therapy, chiropractic and home exercise. Unfortunately, the motor vehicle insurance companies treated Doris as if she was the one at fault for her injuries. There were three insurance companies involved. Their position was initially to lie about the amount of insurance coverage; next it was to lie about the wording of the insurance policy itself, saying that coverage was divided and not added, reducing the effective coverage by 50%; finally, it was to make ridiculouslylow offers of settlement. Boston trial attorney Neil Burns filed suit immediately following the lower offers of settlement. We took the defendants depositions within 45 days; it was our position thatMassachusetts teen age drivers who caused collisions of this nature must be responded to with aggressive litigation. At the depositions, the insurance trial lawyers realized that this was a case to resolve and recommended to the insurance companies that the case be mediated. Our position was to mediate only if we could do so within a month, so as not to upset the aggressive deposition schedule we set up. The case was mediated before a retired chief trial court judge in Boston and resolved that day.